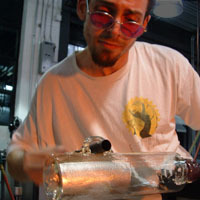 Born in 1979 in Schenectady, NY, Dan has been working in glass since the age of 16. He attended the Rochester Institute of Technology, Alfred University, and the Pukeberg School of Design, Sweden. He currently lives and works in Corning, NY.